The line “good artists copy; great artists steal,” ascribed to Pablo Picasso and appropriated by Steve Jobs in a somewhat controversial 1995 interview, is in many ways at the epicenter of aesthetic endeavors that use today’s modern technology. In a virtual world that provides endless access to great ideas, there is incredible value in tactfully borrowing, weaving together, and editorializing existing material. The art of remix, or reframing original narratives, offers creators a way to convey fresh perspectives on source content, as well as the context in which it first existed. It encourages efforts to improve upon, alter, integrate, and comment on others’ works. Remixing also plays a crucial role in a creators’ navigation of the attention economy, often producing something with even more cultural kudos than the original. Numerous brands are already embracing remix culture, from Nike inviting consumers to remix their trainers with Nike ID, to the various websites opening up their API’s to third party developers. Rather than being passive consumers, remixing provides the general public with a way to actively engage with their favorite brands, further strengthening affinity and loyalty. Whether you’re looking to leverage the art of remix in your marketing efforts, for a personal projects; perhaps to materialize a memory or past event, or to illustrate an important idea in a visually engaging way–we’ll explore creative ways to remix content from audio and video, using transcription in your composition process. Before we delve into the ways in which video and audio content can be remixed, it’s worth taking a moment to nod in their direction, acknowledging their effectiveness in communication. Video, appealing to both sight and sound, captures viewers’ attention immediately, making a lasting impression. Messaging can be concise and simple to comprehend, reaching a broad range of people. 83% of brands using video report it yielding good ROI; 82% say it’s a key part of their strategy. Since most people are consuming content on the go, tapping and scrolling whenever they get bored, serving easily digestible videos is a brilliant way to capture their attention. Considering 85 percent of video content is consumed on mute, adding closed captions is paramount. Captioning content not only accommodates your viewer’s on-the-go lifestyle, but also offers a wealth of marketing benefits–from improving SEO to supercharging marketing efforts. Even more convenient to consume is audio content, because your audience doesn’t need to be in front of a screen. Audio pairs well with driving, cooking, exercising–most activities, really–and facilitates productivity through multitasking. If you’re looking to expand your audio content marketing efforts, podcasting is a great place to start. The space if rapidly growing in popularity, with record numbers of listeners tuning in on a regular basis. According to research from Infinite Dial, 44 percent (124 million) of the US population has listened to a podcast — and that’s up from 40 percent in 2017. If you’re wanting to test drive the medium, we’ve assembled a crash course in starting a podcast, including studio setup, hosting, and everything between. Check out our guide to get started. While effective communication is a notable drawing point of video and audio content, there are so many other things you can do with your content to maximize the ROI. …and more. If there’s a specific topic in your video or podcast you want to dig a little deeper into, why not write a spin-off article? It’s a fantastic way to supplement your original piece, while further establishing your thought-leadership. If your subject matter is challenging to understand, reinforcing concepts with infographics can be highly effective in your audience’s information retention. Not only are visuals processed 60,000 times faster than text, but 65 percent of people are visual learners, making visuals one of the most effective ways to get information across to the reader. With a little creativity, spinning a variety of derivative content is an efficient, effective use of your time. Translating audio or video content into visual art gives you whole new level of aesthetic control. You’re not confined by the limitations of language, but have a broad spectrum of possibility to convey your ideas in a more nuanced way. Especially if you’re highly detail-oriented, creating visually driven content gives you the power to translate your ideas using elements like line, shape, tone, color, and pattern. Art does not necessarily tell people what to do. Instead, it can spur thinking, engagement, and even action. The medium is powerful and the process doesn’t necessarily have to be difficult. The audio or video content can be something you’ve created, or perhaps it’s something you’ve found inspiring: a political speech, a clip from a movie, a meaningful wedding toast. Once you’ve selected your source content, the next step is to turn your audio into text. Ready, set, van Gogh get your transcription on. Today, there are numerous options for transcribing your files. Services around the world offer audio transcription, either from automated speech-recognition software or from humans with transcription jobs. If budget and speed are main concerns, automated options like Temi tend to be significantly cheaper. The price point is lower, but many of the cheaper options tend to lag on the accuracy front. Other human services may provide good results, but come with a high price tag. All things considered–accuracy, turnaround time, and cost–Rev is the best bang for your transcription buck. How exactly do you get started? Follow these simple steps to receive your transcription file back in a blink. Besides 99 percent accuracy and a quick turnaround time, Rev also offers transparent pricing. Rev’s video transcriptions cost $1.00 per minute of audio or video. There is no limit to the number of speakers, and speaker identification is free. If you’ve gotten this far, are keen on the idea of creating art from transcription, but are thinking, “I’m about as artistic as a possum with a paintbrush,” we hear you. No need to fret. If your goal is to create a conversation piece, perhaps as decor in your home or in a more public space, commissioning a professional artist can be a rewarding, collaborative experience. While the craftsmanship might not be from your hand directly, you can still work closely with the artist to align and convey your vision. Providing as much detail as possible, including quotes or excerpts from your transcript, will ensure you’re on the same page with your artist. To get your creativity flowing, below are a few example project ideas. With roots in European Dadaism in the early twentieth century, shadowing modernism, collage is a medium as diverse as it is politically charged. Emerging as a reaction to the First World War, collage allowed artists to interact with existing materials — anything from newsprint and photographs to maps, posters and propaganda — ripping them apart, then reassembling them, creating visually dynamic hybrids. When it comes to incorporating text into your piece, there are various ways to approach it. You don’t necessarily need to illustrate a quote; you can tackle it in an abstract manner by crafting shapes, colors and textures representing it. Instead of including pictures of people, places or things, you might try to capture the feeling of the quote through with visual elements that appeal to you. 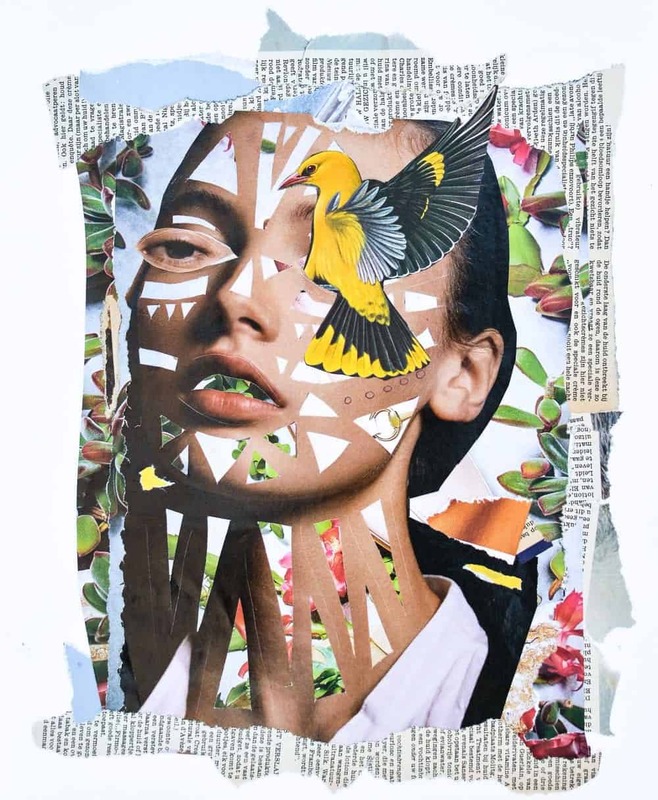 If you’re looking for tips on exploring the medium, there are numerous resources from artists on how to get started, what materials to use, and how to shape a narrative through your collage. You’ve likely heard of vow art–or artistically displaying wedding vows as a means to remember and celebrate promises made to your significant other. Taking it a step further, these unique, hand-folded origami creatures are printed on iridescent paper and come inside a handmade wood base for display and protection. If you’re into Japanese art, or just love the idea of having your vows sculpted into your spirit animals, this would make the perfect anniversary gift or decor piece. Now, more than ever, it’s important to document aging loved one’s story as a means of preservation. While younger generations tend to spend their lives online, tweeting thoughts and snapping moments for Instagram, older generations have a much scarcer presence on social media platforms. According to a Spredfast report, only 10% of internet users ages 65 or older are on Twitter and 8% of that same demographic uses Instagram. Once you’ve gathered a collection of stories, transcribe them easily with Rev, then decide how you want to present them visually on your blog. You could supplement the transcripts with pulled quotes or collage them with vintage photos on your blog. Create and embed a Spotify playlist of their favorite songs from that time period. Of if you want to include some historical context to the personal narratives, research and include news clips using sites like NewspaperARCHIVE. With thousands of plugins available on hosting sites like WordPress, blogs are a digital playground for creative expression. Translating your audio or video content into art using transcription not only facilitates the exploration of new creative territory, it lets you share it with more people. Whether you’re looking to extract value from creative expression, narrative preservation, or broadened distribution–the value is evident in both personal and professional contexts.